The Boeing 747 8 Freighter and 747 8 Intercontinental are the largest iterations of the classic Boeing 747 model which has the ruled the skies for four decades. It is the largest and heaviest aircraft produced in the United States. The new 747 8 is the next generation of this iconic aircraft and benefits from technologies and enhancements that were used to create the Boeing 787 Dreamliner. New wing technology, engine technology and also increased length to enable a larger passenger payload to be carried. …. insertion of an extra 5.6 metres…. Below you can see where the extra length was inserted on the 747 8 Intercontinental passenger version as well as the 747 8 Freighter version. 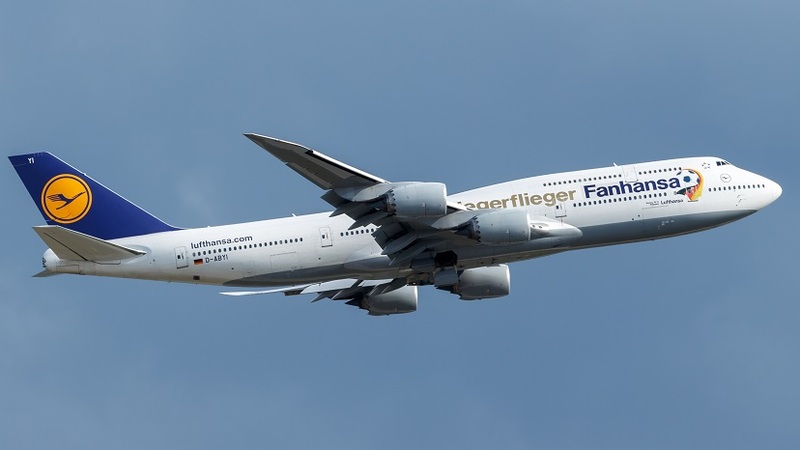 The insertion of an extra 5.6 metres (220 inches) of length as compared to the Boeing 747 400 is slightly different for the 747 8 Intercontinental as compared to the 747 8 Freighter. For the 747 8 Freighter, this is done by inserting an extra 4.1 metres of fuselage length at the forward wing root. The purpose for this is to do it behind the upstairs bubble and thereby not increase the bubble size but rather make it smaller, more reminiscent of the Boeing 747 100 and Boeing 747 200 series. The 747 8 Freighter does not carry passengers, therefore, the bubble is redundant other than the house the cockpit. The 747 8 Intercontinental, on the other hand, has the forward insertion of 4.1 metres (220 inches) placed forward of the wing root so that it takes in the upstairs bubble as well. This way the upstairs bubble, as well as the main deck are extended, increasing the seating capacity dramatically. By how much exactly depends on the airline and what seat pitch they want to apply. Both the 747 8 Freighter and the 747 8 Intercontinental have an insertion of 1.5 metres behind the wing root in the same place. Boeing 747 8 Fuselage Extension. 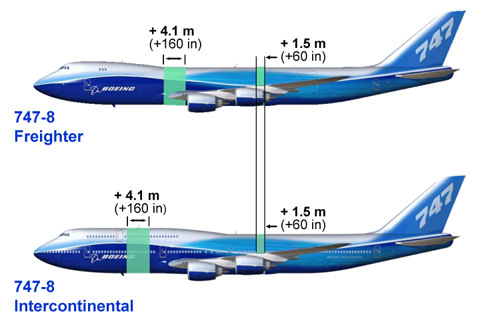 This shows where the additional length was inserted as compared to the Boeing 747 400. Boeing 747 8 example seating plan. A Boeing 747 8 Intercontinental cabin plan for 450 passengers. This would vary from airline to airline depending on the cabin density they are aiming for. We need a section that tells us the weight of the plane empty for the 747-8 specs page. We need to know its weight! Hi and thanks for stopping by. You’re right we did not have that information. We have now rectified that and you will see the line with Operating Empty Weight. Are the current B747 -400 series towbar able to use or need new spec for the towbar. Interesting question. It seems that the same equipment can be used for both the 747-400 and the 747-8. An example is the Tronair A003830D which is rated for both. This of course is not a definitive answer and any decisions about actual equipment purchase should be based on information direct from the supplier. Would you possibly know the deck heights for this aircraft? We can certainly share that with you. So there are of course some variables with this data which are dependant on whether the aircraft is loaded or empty. The measurements below refer to a minimum and a maximum. Maximum is when the aircraft is empty and therefore rises up on its suspension and tyres. Minimum is, therefore, when the aircraft is fully laden. For them main deck, there is a difference between fore and aft, as the aircraft sits slightly nose down on the ground. In this case we have specified Front and rear.